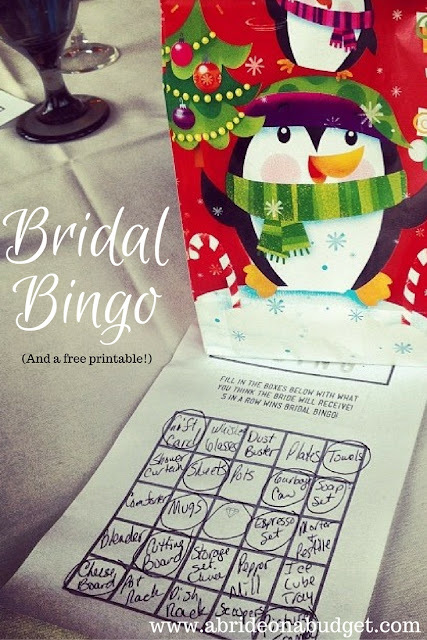 Most people think of Bridal Bingo when they think of bridal shower games, mostly because it's the most popular. But it's not the only bridal shower game you can play. I created a cute Bridal Shower Word Search. 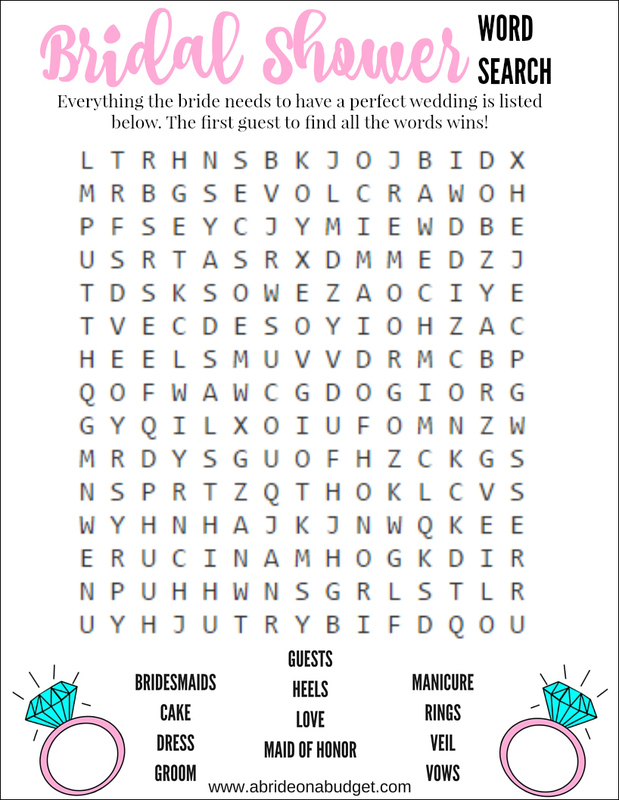 It's filled with everything that the bride needs for her big day, which is why it's a bridal shower word search rather than a wedding word search. All you need to do is print it for your guests. The game itself is made for you. You'll want to print out one copy of the word search per guest. Then, leave it a copy on top of every plate with a pen. Your guests will be able to play while they're waiting for lunch to be served. If you'd rather play at a specific time during the shower, just keep a stack of copies with you. Then, pass this out to the guests. To make it more fun for them, you can say whoever finds all the words first wins a prize. You can give out one or multiple prizes, whatever works for you. And these never have to be big prizes. Go with cute hand lotions, bath bombs, or homemade sugar scrub. You'll have to get the prizes on your own, but I made the game itself for you. It's formatted to fit on an 8.5x11 sheet of paper (which is normal-sized printer paper). Just right click the image below and save it to your computer. Print out as many as you need and bring them with you to the bridal shower. And if you need the answer key, I actually did the word search to make a key. If you're a little more tech savvy, you can actually tile these to fit two on a page so you don't have to print as many. I wouldn't print more than two on a page, though, because it might start getting too small for your guests. Be sure to let me know what everyone thinks! And, if you need the bridal shower word search pdf, just email me and I'll get that emailed to you. BRIDAL BABBLE: Did you use this bridal shower word search at your shower? Thanks for creating this. I just pinned it to my Best Bridal Shower board for my Matron of Honor. Thanks for pinning it! Be sure to let me know if your matron of honor does use it! How cute! My wedding-planning days are behind me, but I still love to swoon over trends and wedding fun! You are awesome! I'm sure it will make a lot of brides happier :) It is absolutely useful for me. This is so fun! I wish I knew of these cute games when I was getting married. Definitely saving for a friend thougH! 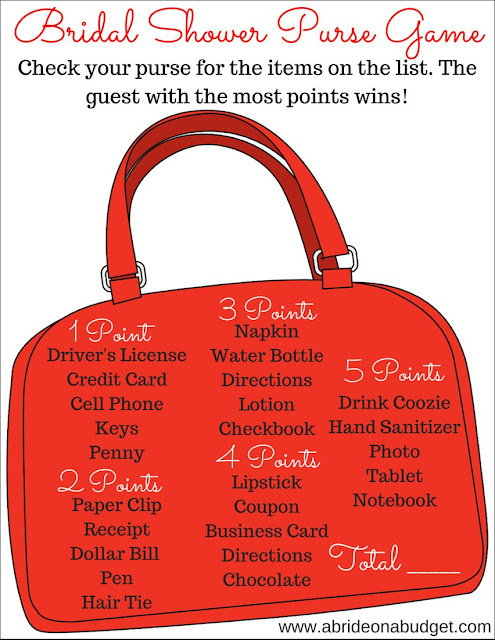 Thanks for the free printable bridal shower game! Ladies do enjoy shower games and this one is fun! Thanks for sharing at Merry Monday. I'll be sharing this game on my FB page today. Can you please email the bridal word search.